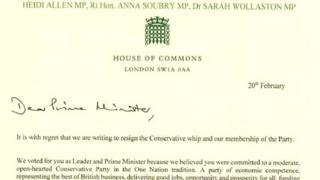 MPs Anna Soubry, Sarah Wollaston and Heidi Allen have written to the prime minister to resign from the Conservative Party. Here is their letter. Brexit has re-defined the Conservative Party - undoing all the efforts to modernise it. There has been a dismal failure to stand up to the hard line ERG which operates openly as a party within a party, with its own leader, whip and policy. We have tried consistently and for some time to keep the Party close to the centre ground of British Politics. You assured us when you first sought the leadership that this was your intention. We haven't changed, the Conservative Party has and it no longer reflects the values and beliefs we share with millions of people throughout the United Kingdom. Following the EU referendum of 2016, no genuine effort was made to build a cross party, let alone a national consensus to deliver Brexit. Instead of seeking to heal the divisions or to tackle the underlying causes of Brexit, the priority was to draw up "red lines". The 48% were not only sidelined, they were alienated. We intend to sit as independents alongside The Independent Group of MPs in the centre ground of British politics. There will be times when we will support the Government, for example, on measures to strengthen our economy, security and improve our public services. But we now feel honour bound to put our constituents' and country's interests first. move to the fringes, leaving millions of people with no representation. Our politics needs urgent and radical reform and we are determined to play our part.